Over the years I've come across various articles, statements and websites which have been critical or even downright offensive towards Srila Prabhupada. As a disciple—or should I say an aspiring disciple since being a true disciple is no easy thing—I find these writings to be intolerable and I'll tell you why. At great personal inconvenience, Srila Prabhupada left the peaceful and holy village of Vrindavan at the advanced age of 69 (almost 70) to travel by steamship across the Atlantic Ocean to fulfill the order of his beloved spiritual master, Srila Bhaktisiddhanta Sarasvati, to preach Krishna consciousness in the Western world. He suffered two heart attacks on board the freighter (not airplane or cruise ship) and arrived in New York City with less than seven dollars in his pocket, completely dependent on the mercy of the Supreme Lord Krishna for the success of his great mission. Prabhupada wasted no time. After more than 30 days at sea, Srila Prabhupada began his preaching work almost immediately by lecturing at the YMCA in Butler, Pennsylvania. The local newspaper, the Butler Eagle, published an article along with the above photo on September 22, 1965, only five days after Prabhupada arrived in Boston and wrote his famous poem, Markine Bhagavata-Dharma. 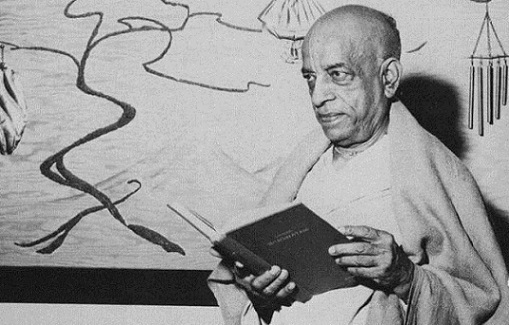 Rather than focus on preaching to the wealthy or privileged class of society, Srila Prabhupada, an educated scholar of Vedic wisdom, chose to deliver his message to the poorest of the poor in the Bowery and Lower East Side of New York. In spite of his exalted position as an authorized representative of the highly esteemed Brahma-Madhva-Gaudiya-Vaisnava Sampradaya in direct disciplic succession from Krishna Himself, Srila Prabhupada always remained humble and respectful to everyone. "A Krishna Consciousness person thinks always about himself as the lowest creature in the world, and the more one thinks like that he becomes elevated more and more. A Krishna Conscious person is never falsely puffed-up; he is satisfied with his humble position as the servant of the servant of the servant of Krishna." Despite his humility, Srila Prabhupada set the standard by his impeccable Vaisnava behavior. Prabhupada always practiced what he preached. There was never any discrepancy between what he instructed and how he lived his life. That is the meaning of acarya, or one who teaches by example. Srila Prabhupada was the first to rise in the morning, and no one could keep up with his incessant devotion and service—day after day, month after month and year after year. In all his dealings with thousands of devotees and members of the public during his numerous preaching tours around the world, there was never a hint of scandal or controversy surrounding Srila Prabhupada or his personal behavior. "The main thing, above and beyond all our differences, was an aroma of sweetness that he had, a personal selfless sweetness like total devotion. And that was what always conquered me, whatever intellectual questions or doubts I had, or even cynical views of ego. In his presence there was a kind of personal charm, coming from dedication, that conquered all our conflicts." "The thing that always stays is his saying, 'I am the servant of the servant of the servant.' I like that. A lot of people say, 'I'm it. I'm the divine incarnation. I'm here and let me hip you.' You know what I mean? But Prabhupada was never like that. I liked Prabhupada's humbleness. I always liked his humility and his simplicity. The servant of the servant of the servant is really what it is, you know. None of us are God—just His servants. He just made me feel so comfortable. I always felt very relaxed with him, and I felt more like a friend. I felt that he was a good friend." If one takes the time to really understand who Prabhupada is and what he is saying, there can be no mistake that he should be regarded with the highest respect and admiration. It is not blind fanaticism or sectarianism to honor the pure devotee of Krishna. Lord Krishna Himself recommends that we approach the bona fide spiritual master in disciplic succession (B.G. 4.34). Because he is the transparent via medium to the Lord, the spiritual master is qualified to accept service on the Lord's behalf. Therefore it should be clearly understood that when we worship the spiritual master we are not worshiping a common ordinary man. He is the authorized representative of the Supreme Personality of Godhead. The worship of Srila Prabhupada is therefore the worship of the entire parampara, and ultimately, the worship of the Supreme Lord Krishna. It should always be understood that the pure devotee never takes the glorification for himself, and this can easily be concluded by studying Prabhupada's books, hearing his lectures, and reading his letters and essays. Srila Prabhupada repeatedly emphasized his status as a humble servant only. "Personally I have no credit for myself, but I am trying to act as faithful servant of my predecessors and just presenting without any adulteration the message which I have received from my Spiritual Master." A pure devotee of Krishna is not an ordinary man of this world. Sometimes it might appear to our limited sense perception that his behavior is on the mundane platform just like the rest of us. But we are cautioned not to make a foolish mistake in this regard. Lord Caitanya has warned us not to commit the "mad elephant offense" which can destroy the delicate garden of devotion in our hearts. The pure devotee is acting solely on behalf of the Supreme Lord for the benefit of one and all. He has no personal motivation or selfish desires. "It is said, therefore, by Vaisnava authorities that even the most intelligent person cannot understand the plans and activities of a pure devotee. The exact words are vaisnavera kriya mudra vijne na bujhaya. A person who is thus always engaged in the service of the Lord or is always thinking and planning how to serve the Lord is to be considered completely liberated at present and in the future. His going back home, back to Godhead, is guaranteed. He is above all materialistic criticism, just as Krishna is above all criticism." Srila Prabhupada has also warned against a disciple becoming "over-intelligent." He gave the example of the mouse who requested the blessing of a sage to make him a cat in order to protect him from being harassed by a cat. Later he asked to become a dog to save him from the unwanted attacks of a dog. Finally he desired to become a tiger to avoid being chased by tigers. Upon receiving this final blessing he approached the sage who had bestowed the benedictions and boldly declared that he now wanted to eat the very benefactor who had blessed him in the first place. So the sage finally cursed him, punar muniko bhava: "Again you become a mouse." Here we learn not to bite the hand that feeds us. Almost every Vaisnava and aspiring Vaisnava in the Western world is indebted to Srila Prabhupada who made the ultimate sacrifice for us all. We might not always understand everything Srila Prabhupada has said or done, but at least we can afford him the honor and dignity which Prabhupada so rightly earned for his selfless service and dedication to the spiritual upliftment of all souls. That alone is worthy of our undying respect.